How's that for a title? 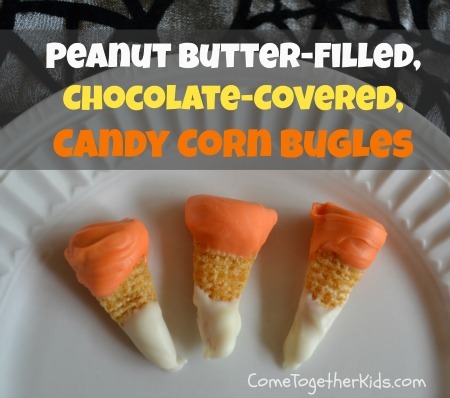 I'd seen the idea for chocolate peanut butter Bugles and thought they'd be perfect in candy corn colors. Now, before we go any further, I've eaten enough candy corn over the years to know that these aren't the "official" candy corn colors in the proper order. I know that it should be yellow on the bottom, then orange, and white on the tips. However, I wanted to keep some of the yellow of the Bugles snacks showing so I had to use the orange at the base to keep the peanut butter in. Believe me, though, once you taste these yummy little treats, you won't care that the color order has been switched around! 2. 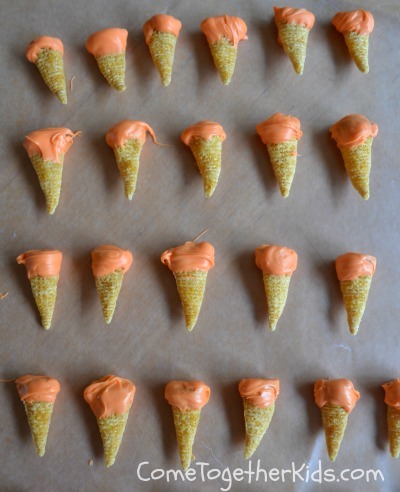 Next, melt your orange melting chocolates and dip the peanut butter end of the Bugles in the chocolate. Put on waxed paper to cool. 3. 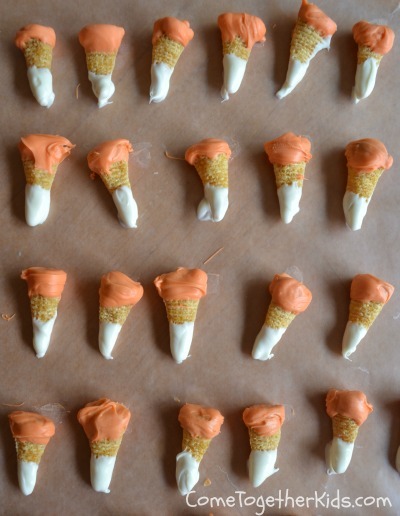 Do the same with your white melting chocolates and dip the pointed end in the white. 4. Allow your treats to cool and harden and they're ready to go! Let me tell you, these were a huge hit with the kids (even their dad loved them). 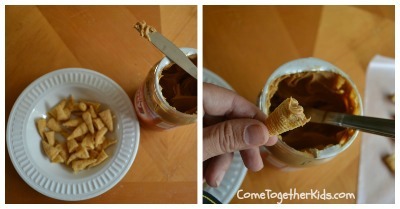 The combination of the chocolate & peanut butter with the salty crunchiness of the Bugles was delicious. It reminded us a bit of a candy bar, a Kit Kat maybe, but with a little more saltiness and crunch. Here is another one of those "No way. I had no clue you could do that" ideas! A couple months ago one of my readers (Hi, Bonnie!) sent me an email telling me that she makes her own little chalkboards for her preschoolers using just construction paper and glue. Now Bonnie said she has been a classroom teacher for over 30 years, so I was sure she wasn't making this up, but I didn't have a chance to actually test it out until recently. Well, it totally works and it's such an inexpensive, easy and awesome idea. I know a lot of schools use dry erase boards, but I think these could be even better for several reasons. First, they're way cheaper. Second, you don't have worry about dry erase markers which are pricey and dry out quickly. 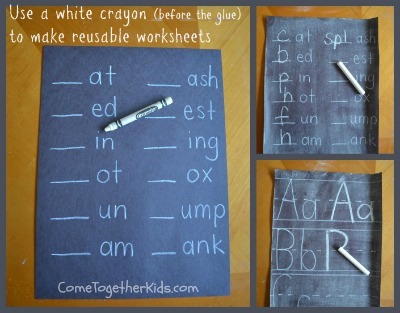 Third, you can even make your own little reusable worksheets with this method! 1. 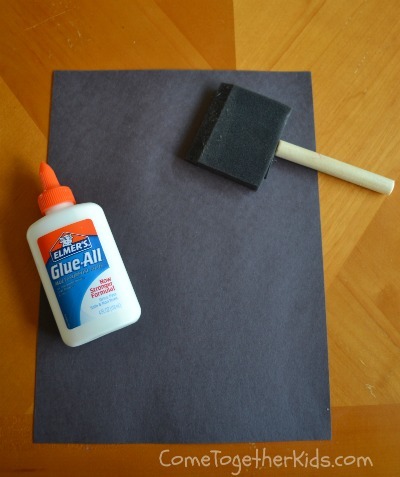 Get a sheet of dark construction paper, a foam paintbrush and some white glue. 2. 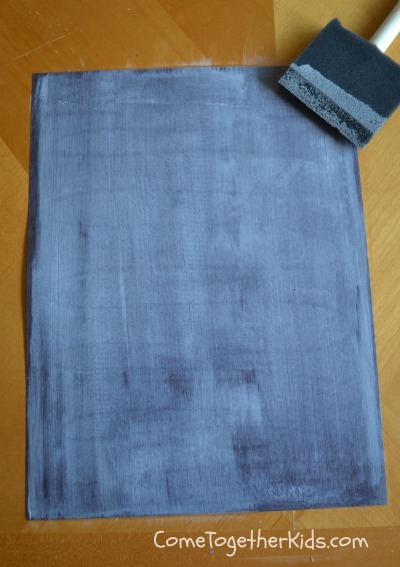 Using the brush, cover the entire sheet of paper with a thin layer of glue. 3. 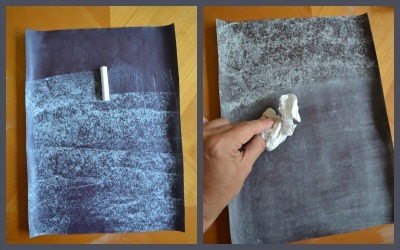 Let it dry completely, then "season" your chalkboard by rubbing the side of a piece of chalk over the whole surface and wiping it off. 4. 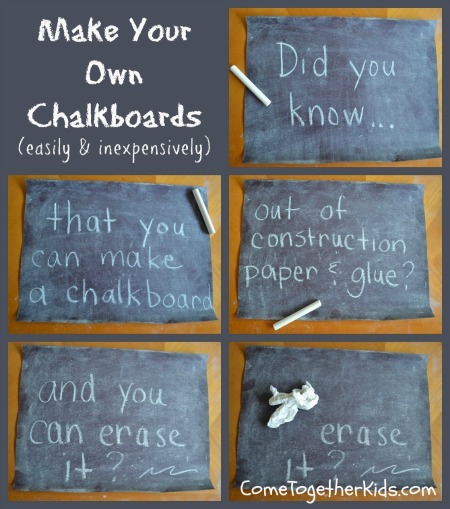 For added durability, you could mount your new little chalkboard onto a piece of cardboard if you'd like. 5. To make a reusable worksheet, just write using a white crayon before you paint on the glue, then continue with the other steps. Pretty darn cool, isn't it??!! 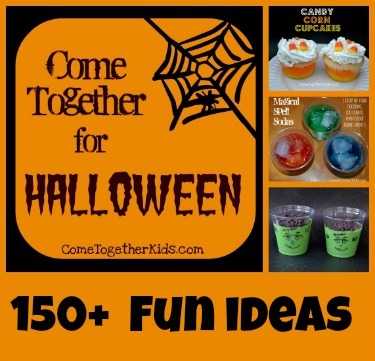 They're easy and cheap enough to make a whole bunch of different ones for your kids at home or to make a set for your classroom if you're a teacher. I've been making this recipe for several years now and it's always a big hit ( I think I originally wrote it down from one of those church cookbooks where everyone contributes recipes). 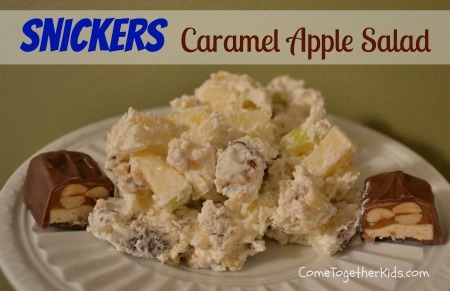 You get all the yumminess of caramel apples, but in a creamy "salad" form. Plus it's a great way to use up all those apples you get while apple picking ~ we're about 20 pounds into the 50 pounds we picked a few weeks ago! 1. Core and dice your apples into about 1/2" -3/4" pieces. 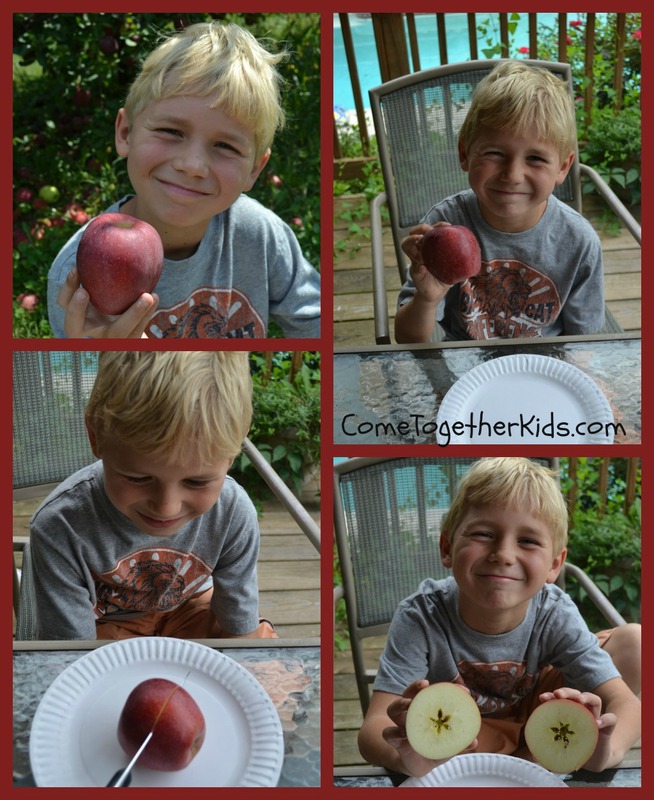 I use both red and green apples and usually leave the skin on, but you can peel them if you like. 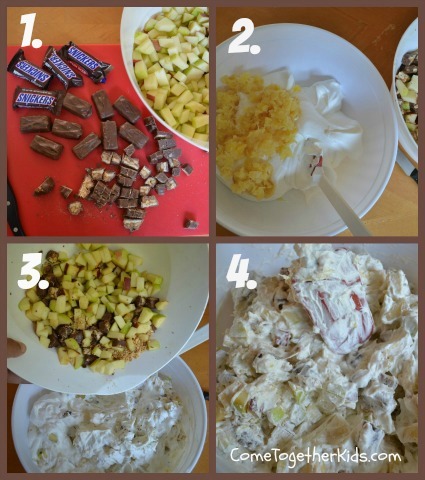 Cut up your Snickers bars into pieces about the same size as your apples. Add the chopped nuts and set aside. 2. Drain the crushed pineapple and squeeze out as much of the excess liquid as possible. Mix together the Cool Whip and the pineapple. 3. Gently fold in the apples, Snickers and nuts and gently stir until everything is combined. 4. Refrigerate until ready to serve and enjoy!! As I mentioned on our Facebook page, the kids and I went apple picking yesterday at a local orchard and came home with 50 pounds of apples! 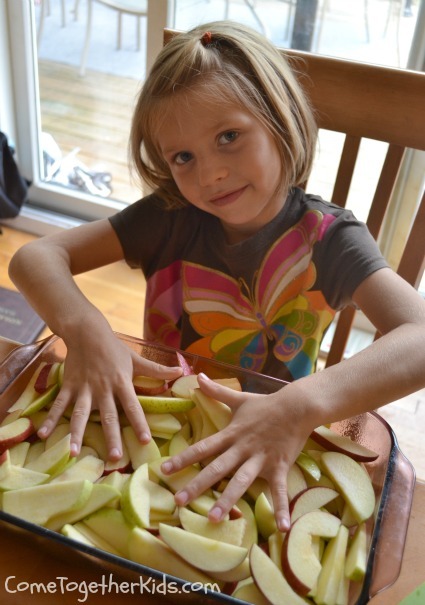 We'll eat some just fresh and make some into Homemade Applesauce, but we knew we wanted to make some tasty desserts with all those fresh apples. Luckily, a friend had just pinned this Fresh Apple Cake by A. Liz Adventures ~ what timing! 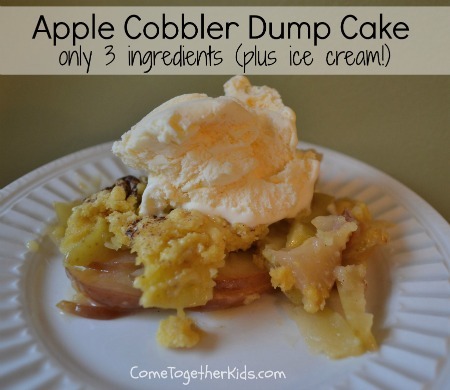 An easy recipe using fresh apples and I had all the ingredients on hand. 1. Spray a 9x13" baking dish with cooking spray. (You could easily do it in a smaller dish too, just adjust the amount of each ingredient). 2. 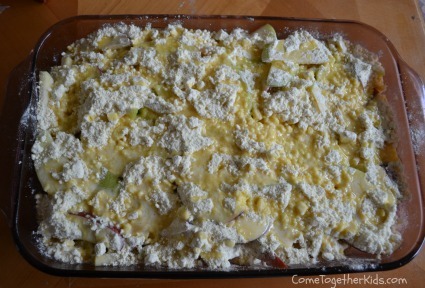 Dump all the apples in the dish and spread them evenly over the bottom. 4. Melt a stick of butter and pour the melted butter evenly over the cake mix. 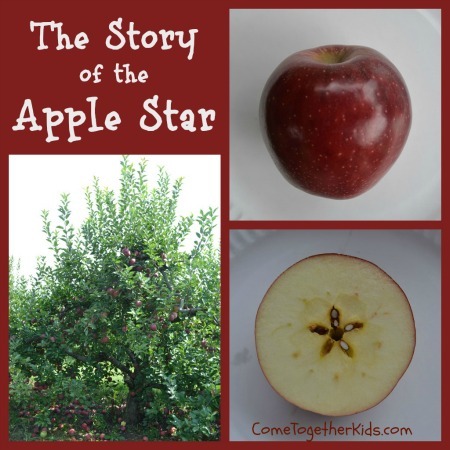 Years ago at a fall festival, I remember a story teller telling a really cute story about the star that you see when you cut into an apple. 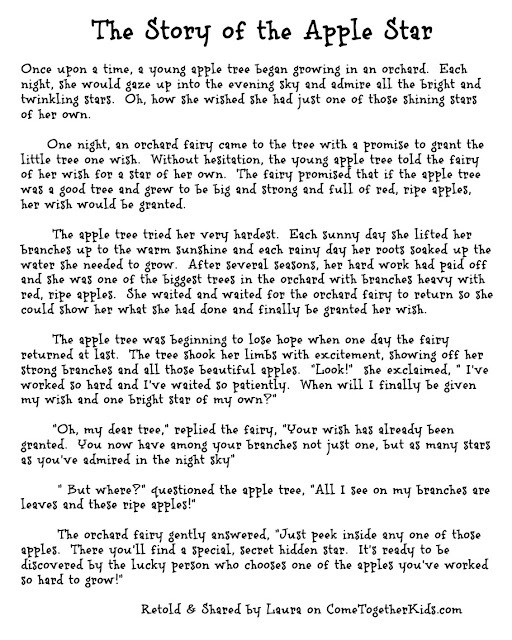 When the kids and I came home from apple picking at the orchard today, I thought it would be a fun time to share the little legend. However, although I remember the basic premise, I couldn't remember any of the details. Googling led me to several versions of "The Little Red House with No Windows, No Doors, and a Star Inside" but I couldn't find the story I'd heard. Finally, I came across this version on a site for Girl Scouts. It was short, but was the closest to the one I'd heard a long time ago. I decided to elaborate on it a little bit and make my own version. It was a big hit with my kids and I like how it includes a little lesson on how hard work and patience can bring you rewards. Click HERE or on the story below for a printable PDF version! Definitely check out the version that inspired me HERE (she also has a cute dried apple wreath project to go with it). 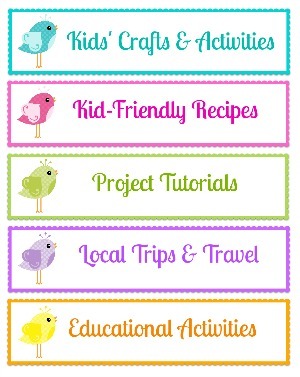 was started in the Fall of 2011.
to fill the days & nights of the Halloween season with fun projects and activities. you can do with your kids for Halloween. to keep kids having fun this holiday. 1. 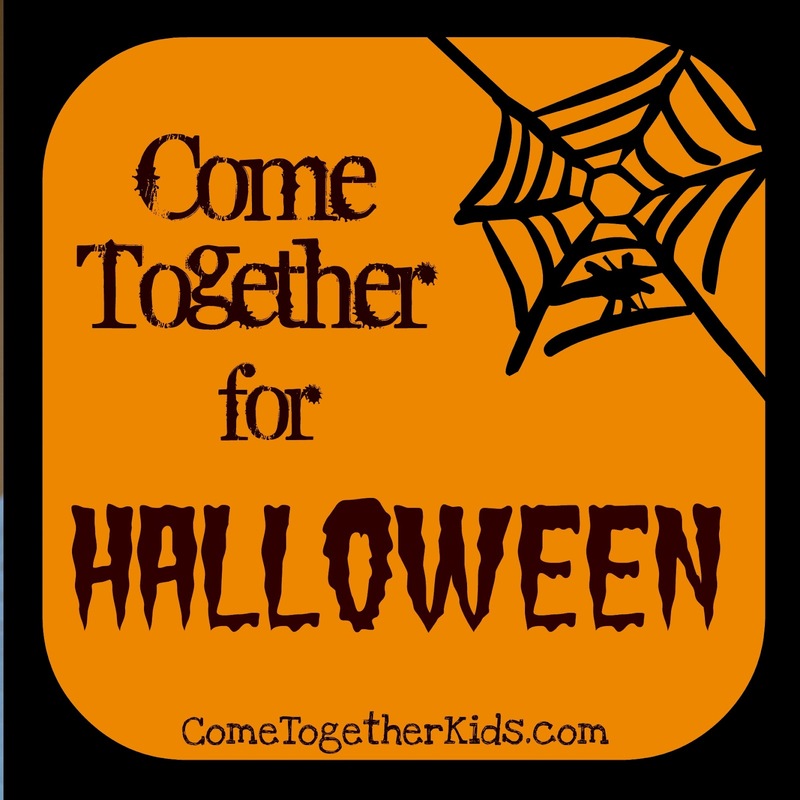 You can link up as many ideas as you want, as long as they are Halloween-related. 2. Please don't link up your business, shop or unrelated posts. and stop back often for fresh inspiration. by including a text link back to Come Together Kids. this post on Facebook or Pinterest! As you might have noticed, I'm making a few little design changes here on the blog. I want the layout to be a little less crowded and easier to navigate. Please bear with me as I fiddle around with stuff over these next few days. 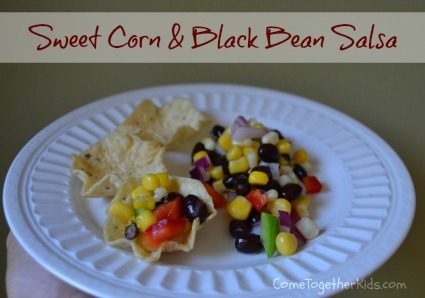 It's great with chips but just as yummy just by the spoonful! 1. 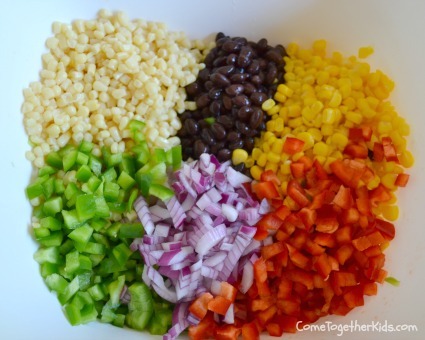 Open all your cans, drain or rinse your corn and beans, chop up your peppers and onions, and dump it all in a big bowl. 2. Combine the sugar and vinegar, and pour over the veggie mixture. 3. Refrigerate until it's time to eat. (You can definitely make this the night before, it's even better the next day). Serve with chips. NOTE: This recipe is really flexible. I like the colorful look of both white and yellow corn and red and green peppers, but you can easily just use one or the other. You can also add a little more of one veggie and less of another depending on the size of your cans or the size of your peppers, and it'll work out just fine. I'm excited to have another great guest poster here today ~ a fun mom whose blog's name just epitomizes life with young kids! Those of you with younger children may have already heard about the sensory play movement (providing your kids with opportunities to play and explore using their five senses). However, for those of us with somewhat older kids, don't worry, many of the ideas for young toddlers can be just as fun for our big kids too! Heck, after seeing these five great ideas Amanda is sharing today, I think even adults would have fun getting a little messy alongside their kids. Hi, I'm Amanda and I blog over at Dirt and Boogers. 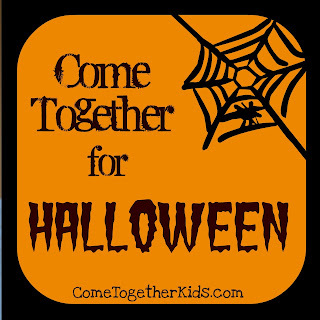 I am thrilled to be guest posting today at Come Together Kids! 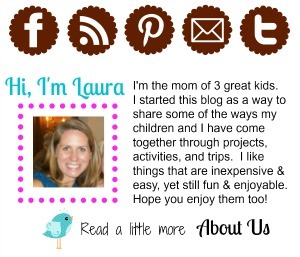 I love Laura's blog! I'm the Mom of a 2 year old, J, and expecting a new baby in January. I believe that play is the most important part of childhood, so I blog a lot about the playful activities I do with my son. I also try to give some helpful tips and tricks of surviving parenthood along the way. Our favorite kind of play around here is to get elbow deep in sensory play. So today I'm going to show you my top 5 Messy Sensory Play Ideas for Toddlers! 1. Whipped Cream: I simply dyed some whipped cream pink and let him go at it. He got so messy, but had so much fun! 2. Water Beads and Shaving Cream: This has a fantastic texture and was hours of fun! 3. 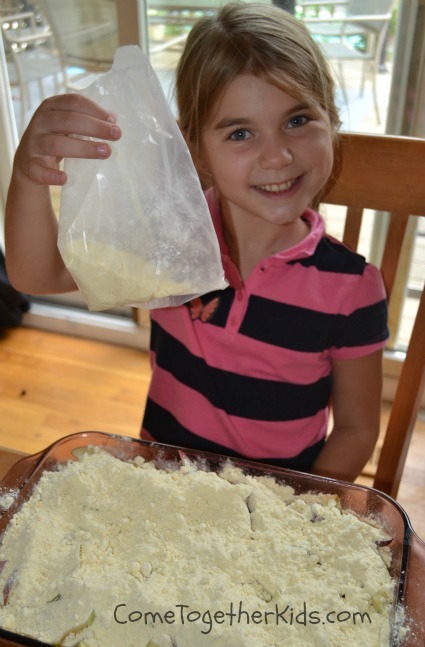 Cornmeal Letter Discovery: This was a great activity for when J started showing some interest in letters. Seriously fun and a wonderful learning experience too! 4. Dish Soap Foam: This was seriously easy and a perfect toddler activity. Don’t all kids love bubbles? 5. Jello and Cars: Nothing like mixing ooey gooey jello and cars! Any little boy’s dream. 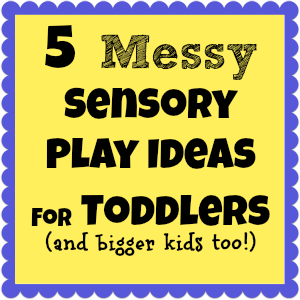 Now, not all of our sensory play activities make big messes. 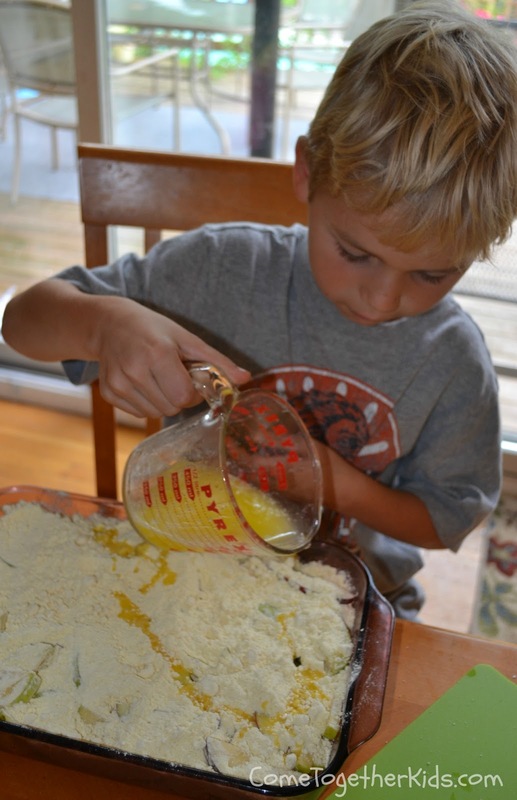 Here are a few more “non-messy” sensory play ideas you can check out. I also have a round up of 25 Sensory Trays that might give you some inspiration! Thank you, Laura, for inviting me to you fabulous blog today! I have to be honest with you, there are certain chores that I don't like to do ~ emptying the dishwasher, putting away clean laundry and packing lunches for three kids every morning top my list. (There are lots of other things on that list too) However, I realize that I can't put in more dirty dishes unless the dishwasher's empty, we need to be able to wear the clothes I've already washed and dried, and my kids need to eat while they're at school. 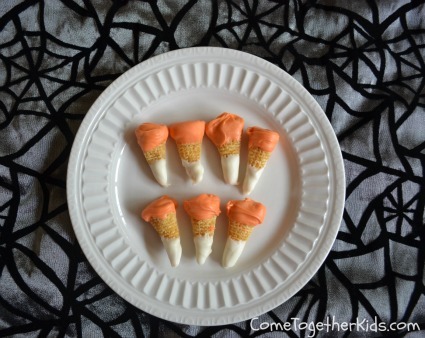 So this isn't going to be a post showing how to make an adorable themed lunch for your child. (Don't get me wrong, I love seeing all those cute sandwiches cut and decorated in elaborate shapes and my kids would go nuts if they ever opened their lunch box to see one of their favorite characters made out of food, but it's just not going to happen here.) Instead, if you're like me and lunch-making isn't your chore of choice, here are just a few things that have been working well for us. Reduce Stress by doing as much as you can before hand. 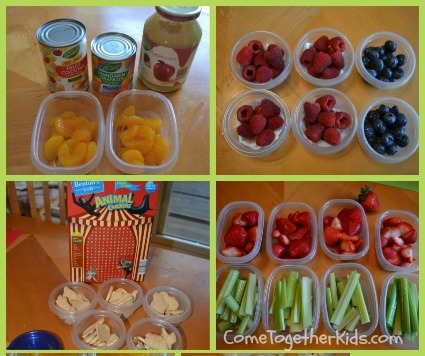 School day mornings are hectic enough without having to figure out what you'll be putting in the lunchboxes that day. My kids don't really like the texture of sandwiches that have been refrigerated over night, so I make the sandwiches or "main dish" each morning. However, we try to have all our "side dishes" portioned out, packaged up and ready to go. Save Money by buying regular (or bulk size) packages and making your own individual-sized servings. If you look at the price per pound or ounce in the grocery store, you'll see that the individual sized packages of crackers, cookies, and other treats can be almost double the price per pound of the larger packages. Also, as handy as the prepackaged apple slices or cut fresh fruits can be, you often pay significantly more for that convenience. We have been trying to package up our fruits and snacks on Sundays, and then refill and restock once more later in the week. 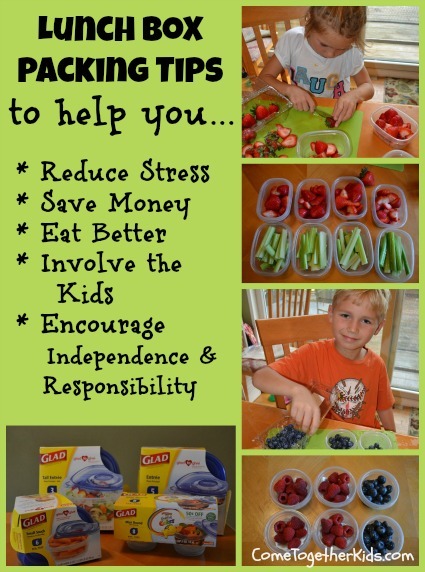 Eat Better by having healthful snacks packed up and ready to go. As much as I recognize the benefits, we don't eat only organic and my kids still get some "junk food" in their lunches or after school for snacks. However, I know we're much more likely to include a good variety of fruits and veggies in our diets if I make a stop at the produce market and get everything sliced up and ready to go. Also, by taking a few minutes to portion everything out before the week starts, I know that I we'll actually eat the food and those strawberries or cucumbers won't go bad sitting in their original cartons in the back of the fridge. Involving the Kids has really made a difference this school year. 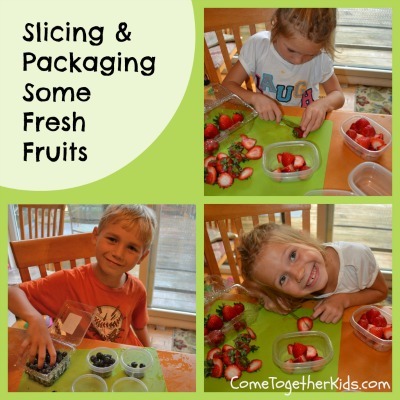 Many of the softer fruits like strawberries can be sliced with a not-too-sharp knife and the kids don't mind helping to slice and package if they can sample a few. 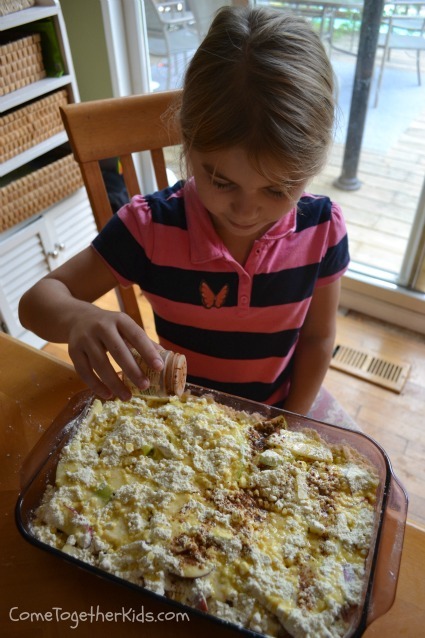 My oldest daughter (almost 10) loves to help in the kitchen. 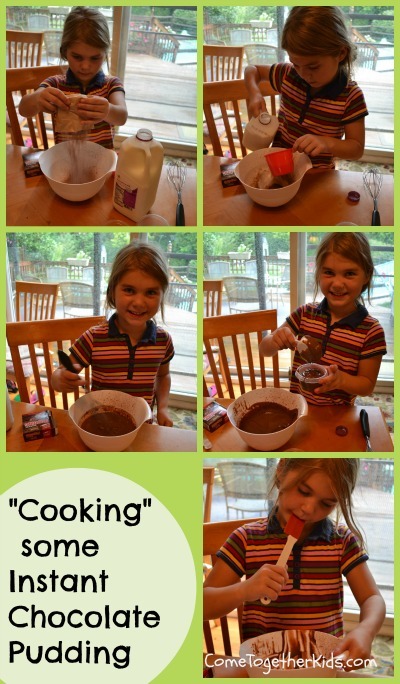 I know she feels so important and helpful when I let her make up some instant pudding, jello or other "recipes" for lunches and after school snacks. 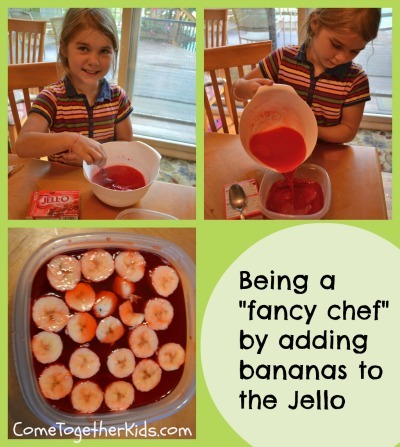 Just so you know, regular Jello is good, but adding fruit slices makes it much fancier! Finally, you can Encourage Independence and Responsibility by letting your kids partially pack their own lunches in the morning. As I mentioned, I will still make their sandwiches or pack their hot "main dish" in a thermos, but I'll let the kids pick out their own sides from our prepackaged containers. Depending on what we've made up, they usually have to get out two fruits or veggies and one or two other sides (jello, pudding, yogurt, crackers, etc.). They're not quite to the point where they can pack their own lunches completely ~ but this puts them well on their way.